JetBoost Download This program has just appeared in Beta format, sure to improve later but we think it is very good and achieves its goal. It serves to optimize your computer to make it more efficient at the time the most current pc games functions properly. We all know the problems that a pc can get to give when starting to play with a game of the most recent. We end up thinking that our computer has become obsolete and that we will have to expand your Ram memory, change your graphics card and so on. 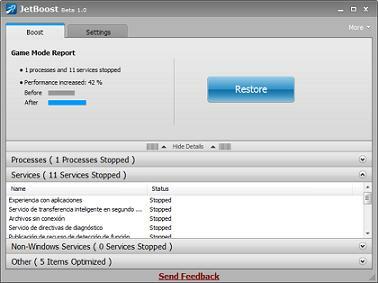 But not always, the reason that a game does not work correctly is in those issues, it can also be in others that JetBoost helps you to correct to optimize the pc to play. JetBoost searches for and finds processes, services, and other items that Windows has active at the time and are not required to play. It shows them to you and gives you the possibility to close them all or whatever you want.